On January 22, Bakersfield resident Jasmine Sierra was found murdered in her apartment. Friends did not learn of her death, however, until two months later because police reports used her male name with no mention of her transgender identity. Sadly, her murder and the indignity of being misgendered is a fate that has befallen too many in the trans community. I learned of Jasmine’s death after seeing an article in the local paper. Horrified that something like that could happen where I live, I decided to organize a vigil as a way to honor Jasmine and a rally to call out the Bakersfield Police Department for its handling of her case. Over 40 of Jasmine’s friends and family turned out for the March 12 rally. I was fortunate enough to meet Jasmine’s sister, Ramona, who shared with me that one of Jasmine’s fears was that she was going to be murdered for being transgender and that she would be buried as a man. It is a fear that many in the trans community must grapple with. Ramona loved and supported Jasmine, and shared with those gathered that Jasmine was a loving, funny, and generous sister and friend. 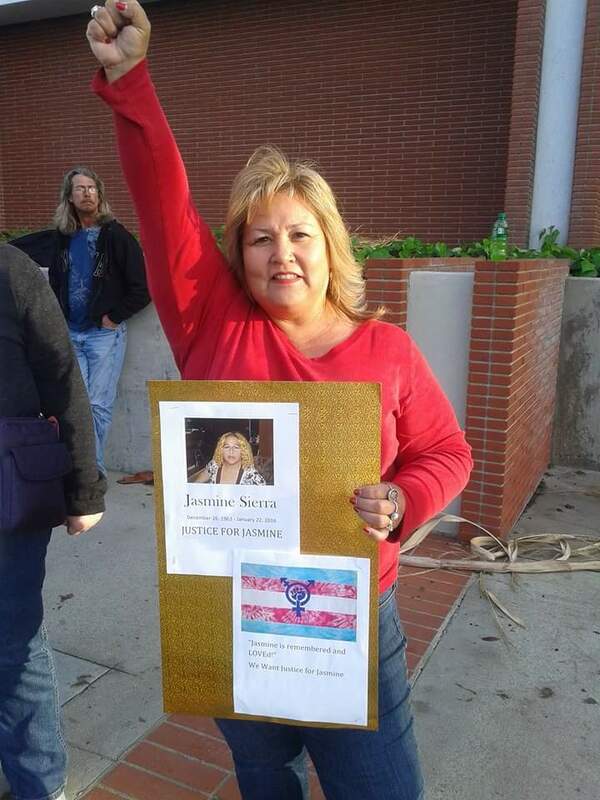 Karen Adell Scot, executive director of the Fresno-based Trans Care, also spoke at the rally. She called on the Bakersfield PD to find Jasmine’s killer and bring them to justice, recalling the unsolved murder of K.C. 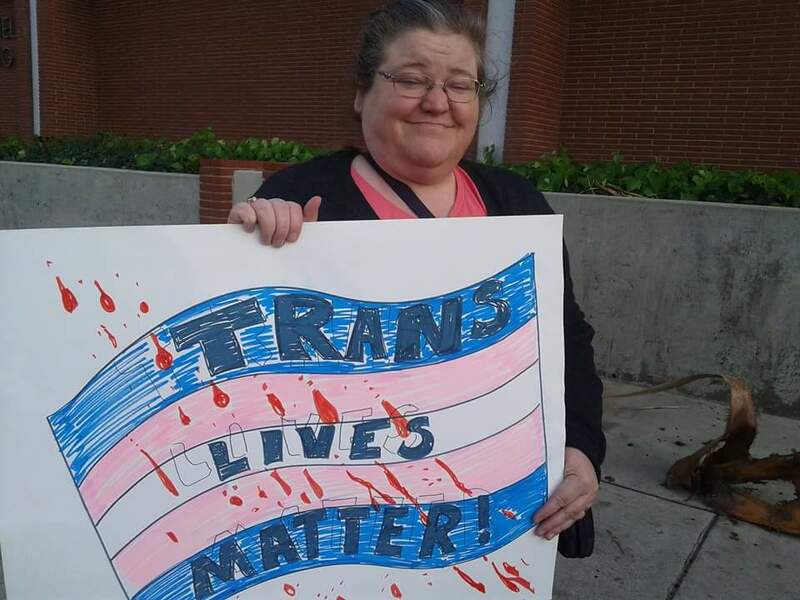 Haggard, a transgender woman from Fresno who was murdered in June of 2015. Scot told the crowd that she intended to lobby her state representatives to pass legislation requiring law enforcement agencies to report when a victim of a homicide may be transgender or gender-non conforming. Meanwhile, the local LGBTQ community has erupted online. 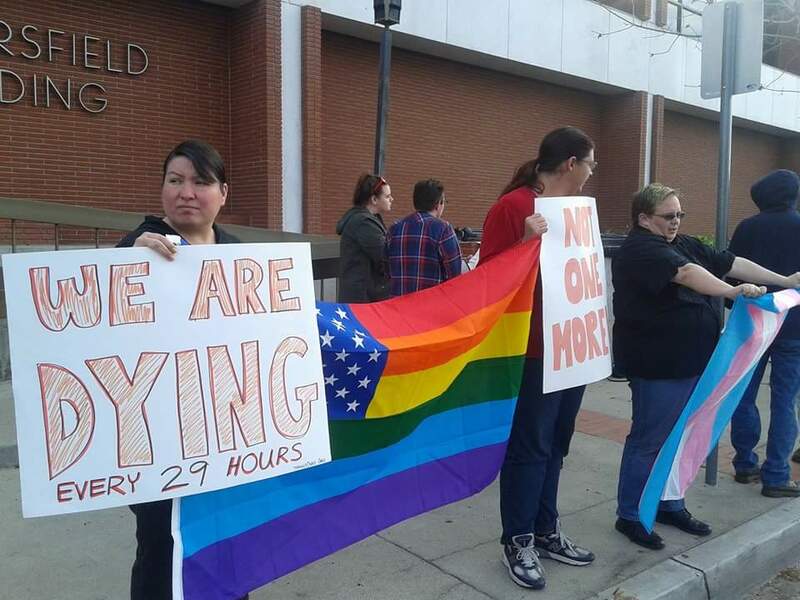 Allegations surfaced on social media soon after Jasmine’s death became public that authorities had intentionally mishandled the case, pointing to lingering mistrust between the trans community and local law enforcement. 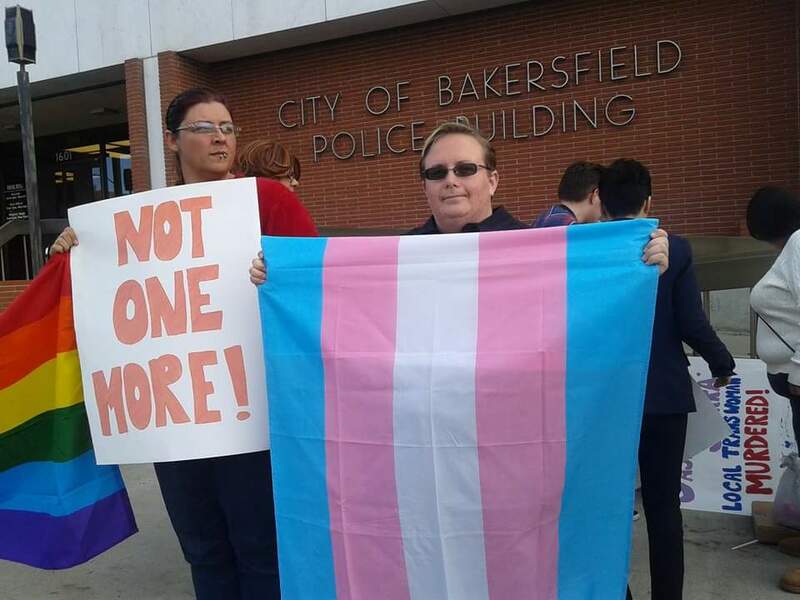 Whitney Weddell, the chair of the Bakersfield LGBTQ non-profit, said she had pressed the Bakersfield PD for information, and was told that as of yet there are no leads or suspects. Violence targeting members of the transgender community has risen in recent years across the country. In 2014, the National Coalition of Anti-Violence Programs reported that 55 percent of all anti-LGBTQ murders were directed against transgender women. In 2015, there were 21 transgender women killed, the majority of them women of color. Earlier this year, a transgender woman in Texas, Monica Loera, was killed in her home, with reports identifying her as a man and using her birth name, David. 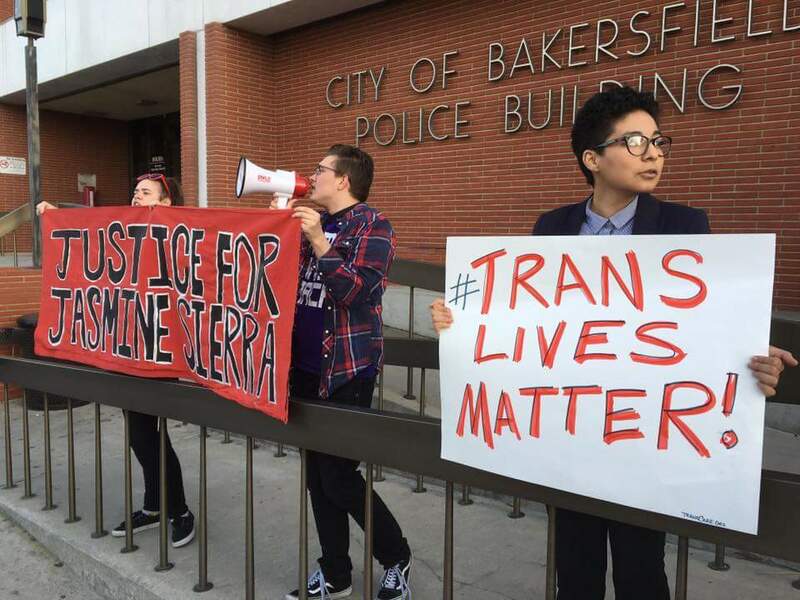 Bakersfield’s trans community has yet to receive an apology for the misgendering of Jasmine in police records, nor has there been an update to the local media reports of Jasmine’s death reflecting her actual gender and name. Those that knew Jasmine were blessed to have her in their lives, and the more that I heard about the type of person Jasmine was, the more I regretted that I would no longer have the chance to meet this energetic person. It saddens me that people in my community fear for their lives and are at great risk of violence for just being themselves. It is instances such as these that fuel my passion to help make the world a safer place for people who do not neatly fit into the norms society has set for us. Dean Welliver, 19, is a community activist and a former South Kern Sol youth reporter.